Over the past month, these baskets have taken the decorating world by storm, and I figured it'd be a shame to not share them with you! 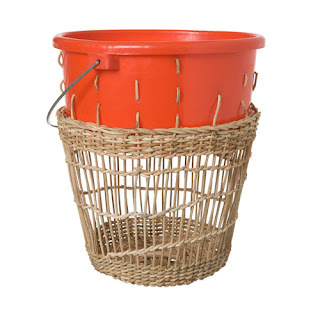 The production company of the product, Areaware (check out the baskets on Areaware's site), describes the baskets as being a "study in contradiction", as they fuse the elemtents of natural rattan with a poppy plastic. 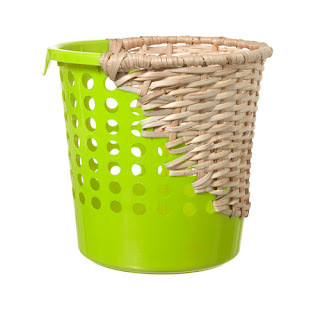 At $48 a piece, these baskets are not for the timid, but for those areas of your home that deserve a punchy statement piece. And these baskets certainly take upcycling up to the next level! I would love to even try to fuse one of these together myself from found objects. I would like this one to come home with me. They certainly are fascinating to look at, and I could definetly see one of these adding a bit of life to our bathroom!